The small, black Porta Brace Video Vest is made especially for ENG and EFP photographers and sound technicians. 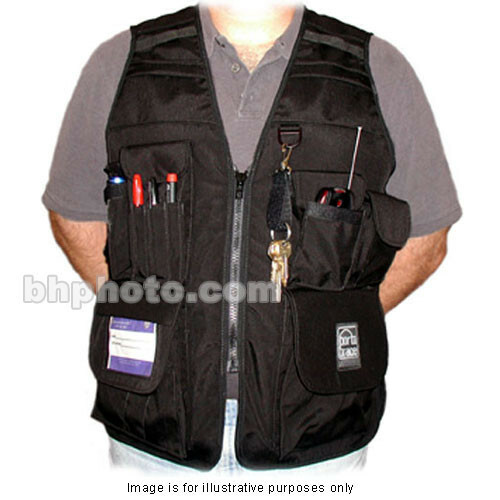 The Video Vest offers a comfortable, practical solution for audio/video technicians. It is made of a mid-weight Cordura fabric and is very durable, waterproof and has a soft inner layer. There are 23 pockets for brick batteries, tapes, tools, secure passport and wallet, pens, Rain Slicker, ID, lunch, and even DV camcorder. There is grab handle on the top and a mesh vent on the rear of the vest. Adjustable side cinches allow extra room over sweaters. Additional side zippers provide extra freedom when needed. Box Dimensions (LxWxH) 18.0 x 10.5 x 3.5"